This is one of my all-time favourite layouts, and definitely qualifies as achievable. Jim Dufour is building a slice of the Boston & Maine Railroad’s Cheshire branch through New Hampshire in HO scale. Jim’s layout is basement-sized, but doesn’t fill the basement. There’s plenty of space for people as the layout hugs the basement walls. Jim resisted the temptation most people would have to pack the space with large yards, roundhouses, and major towns. Instead, he is modelling – very, very well – a couple of smaller places on the line. At the west end, there’s Joslin. A depot, a passing siding, and a spur behind the station. Heading east, there are a couple of spurs before reaching a passing siding and station at Webb. Continuing east on reaches the main town on the layout – Troy. Here, one finds a depot, a couple of other railway structures, and a couple of spur – one of which acts as a team track. There’s also a lap siding and double-ended siding serving the freight house. All very modest. Next up is Fitzwilliam, with a siding and two spurs, surrounded by a depot, freight house, and a section house. 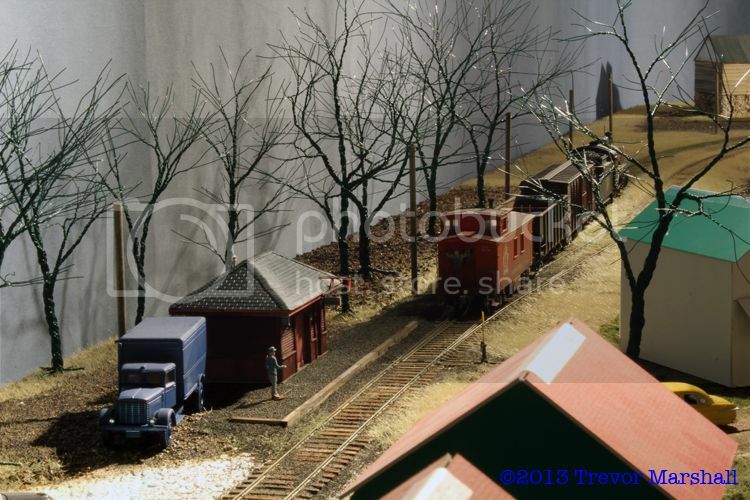 The last location modelled is State Line, with a depot and freight house on a passing siding. From there, it’s back to staging. Notice the consistency from town to town: each has a depot, some have a freight house. Some have a spur or two for switching. As you’ll see in the videos below – shot by our mutual friend David Haney during a recent visit to Jim’s layout – the places look right. There’s space where space should be. There’s great attention to detail. And the best part is that since this is still a layout under construction, there’s much more to come. Jim’s layout is proof that an achievable layout can also be an excellent one. I always look forward to following Jim’s progress. 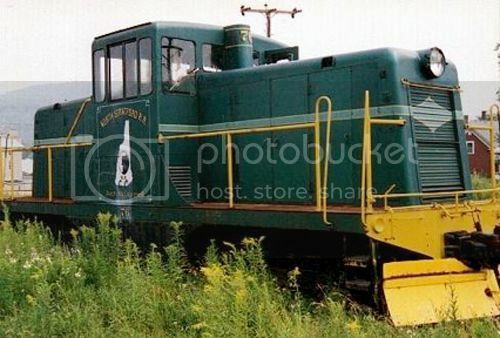 Sometimes, I come across a standard gauge prototype that reminds me a whole lot more of a narrow gauge one. 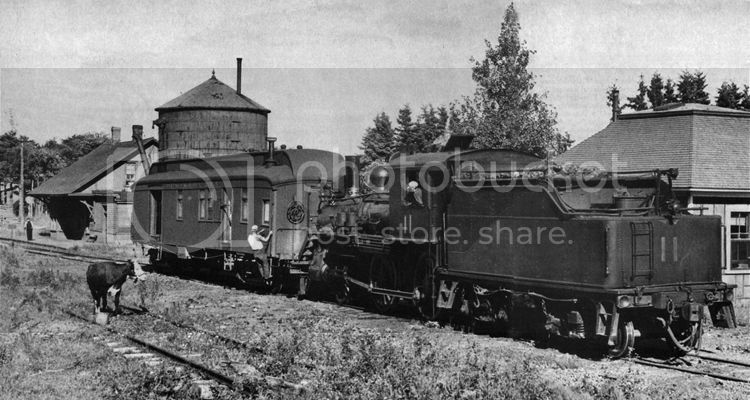 The first time I saw the above photo of the Temiscouata Railway I thought I was looking at a three-foot operation. It’s the cow, I think, that makes the scene – and there’s a story about the cow, but not just yet. 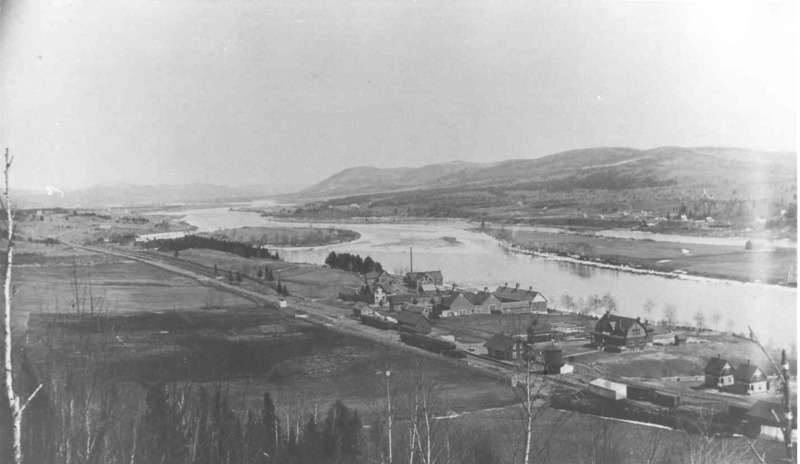 The Temiscouata Railway ran 81 miles southeast from Riviere du Loup, Quebec to Edmunston, New Brunswick. There, the line turns west to follow the Saint John River another 32 miles to reach Connors, New Brunswick. In the 1940s, the line rostered two 4-4-0s to handle passenger service – including the one seen in the lead photo. In addition, five 4-6-0s took care of freight (and covered for the 4-4-0s when they were in the shop). A round-trip passenger train ran as No. 1 and No. 2 between Riviere du Loup and Edmunston, taking about four hours for each direction and averaging about 20 MPH. The line from Edmunston to Connors saw mixed train service. Traffic on the line reflected its path through New Brunswick and Quebec forests, and its role as a vital link to communities. Outbound loads consisted mostly of products from the lumber industry – including finished lumber, pulpwood, shingles, ties and poles. The balance included farm products like livestock, potatoes, and grains. Inbound traffic consisted of all the stuff one might expect delivered to small rural communities: merchandise, grain, flour, coal, and so on. The photo was taken at Connors. This small terminal consisted of a single-stall engine house, a station, a hand-operated turntable, a water tank and a bunkhouse for the crew. A couple of sidings provide space for sorting cars and re-ordering the mixed train. And since this was a layover point for the crew, the place warranted a watchman to look after the locomotive overnight. The cow, apparently, belonged to him. The model possibilities are tremendous, in a number of scales. The passenger train from Riviere du Loup to Edmundston was typically a three-car affair with wood-sided, clerestory-roofed equipment painted red. A combine, a coach and a baggage-mail car filled out the train and offer good variety for the modeller. Labelle Woodworking probably has some appropriate kits to use as starting points in HO or O scales. In HO, the very nicely detailed and smooth-running 4-4-0 and 4-6-0 from Bachmann would be great starting points for detailing projects. I’m not sure about wheel spacing or diameters here, but hey – it’s the Temiscouata! Who’s going to challenge you? I first learned about this great, and manageable, prototype from a four-page article by Mike Runey that appeared in the May 1980 issue of Railfan & Railroad magazine. It originally appeared in the June 1948 issue of Railroad Magazine. 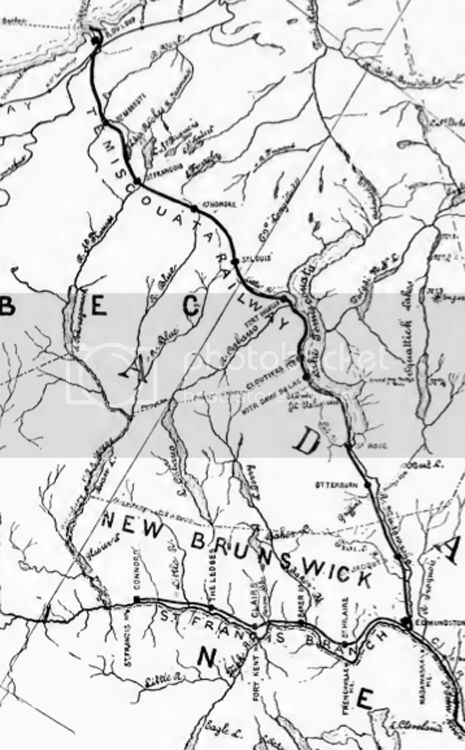 There’s also an excellent write-up on the Temiscouata Railway on the Old Time Trains website. Author Wendell Lemon has done a great job of providing a more extensive history, and has included many inspiring photos – including pictures of the 10-wheelers. 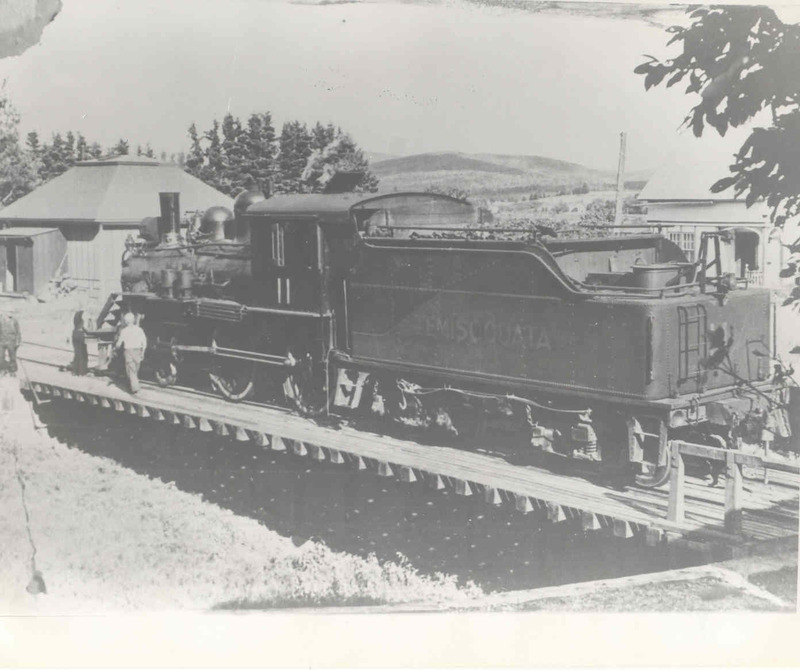 – This photo shows 4-4-0 #11 on a turntable, possibly at Connors. 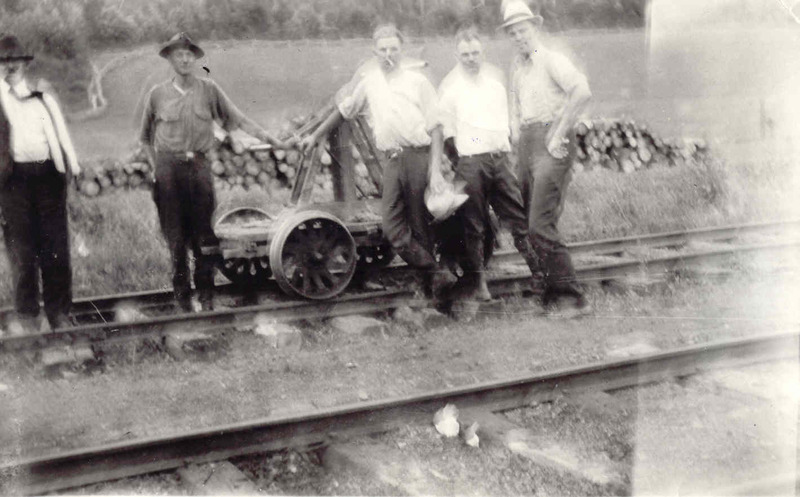 – Here’s a group of men around a section car at Connors. – This is a lovely view of Connors, taken in 1894. Not much has changed by the time of the photo at the top of this posting, I’ll bet. If you want to explore more, here are links to the pages. Note that the pages are in French and only a few images on each page are railway subjects, but even for anglo-only readers it’s a good way to spend a bit of time on the web! My thanks to fellow narrow gauge enthusiast Tony Ferraro for reminding me about this great standard gauge prototype! The North Stratford Railroad is a 26-mile short line that ran North from a connection with the Grand Trunk at North Stratford, New Hampshire to Beecher Falls, Vermont – near the Canadian border. At one time part of the Maine Central Railroad, the line was rescued from abandonment in the 1970s by the state of New Hampshire. In its new incarnation as the North Stratford Railroad, the line is as simple an operation as one could ask for, with two locomotives (an Alco S1 and a GE 44 tonner) plus a large fleet of boxcars to serve the railroad’s single large customer – the Ethan Allen furniture plant at the end of the line. To learn more about the North Stratford Railroad, including a sample layout plan, I recommend the article by T. Bram Bailey in the June-July 1985 issue of Prototype Modeler magazine. This article used to be archived at TrainLife but no longer appears to be available there, so interested readers will have to go on a hunt. As Bailey’s feature explains, there are a couple of other opportunities for online switching – including an Agway operation in Colebrook. But the primary customer – the reason for the line’s existence – is Ethan Allen. Bailey’s article notes the railroad hauled loaded boxcars of furniture from Ethan Allen to the GT interchange, while inbounds destined for the factory included empty cars for loading and loads of furniture subassemblies. In HO, one could easily model the entire line, including the interchange with CN. The plan in Bailey’s feature occupies a 10-foot by 15-foot space and all of the short line’s trackage is within easy reach of the aisle. In larger scales, some of the scenes are too deep to maintain so the plan would need to be adjusted. That said, at 20-feet by 30-feet, it’s not a huge plan for O scale. An alternative would be to focus on the Beecher Falls scene, creating a terminal-to-staging style layout (as I have done with my S scale Port Rowan layout). Regardless of whether one tackles the whole line or just Beecher Falls, I would be tempted to enhance the trackage at the Ethan Allen factory ever so slightly, adding a second track for inbound loads. That would enhance switching by requiring the operator to separate loads from empties for spotting at separate doors. Further operating interest could be added by requiring the inbound loads to be sorted into spot-order for Ethan Allen. Would the real railroad have done that? Probably not in the Maine Central days – but short lines are noted for their personable service and willingness to accommodate their customers’ needs. Again, it would enhance switching. All the equipment needed to build this layout has been produced in HO, S and O scales. 40-foot boxcar models are ubiquitous – buy them in bulk. In HO, the Alco S series switcher has been done by several manufacturers, while Bachmann has done the 44 Tonner. Brass versions of the Also switcher have been done in S and O scale. In S, one can opt for a brass 44 Tonner from River Raisin Models, or a resin kit from Smoky Mountain Model Works. In O scale, Rich Yoder Models has offered the 44 Tonner in brass. Lettering might be a challenge, but the boxcar lettering has been produced in HO and O by Highball Graphics, and my guess is that the logo would work on the locomotives in a pinch. What’s more, I know from experience that Highball Graphics does a very nice job of custom decals, so getting sets for S scale should not be an insurmountable problem. Short lines are great prototype inspiration for achievable layouts. Many will recall the excellent set of articles in the September 1978 issue of Model Railroader on the Arcade & Attica Railroad – a New York short line that survives to this day. A similar in-depth treatment in the August 1979 issue of MR covered another New York short line – the Fonda Johnstown & Gloversville. To see how this line can be modelled effectively, check out the HO scale layout by Steve Lamora in the February 2004 issue of Railmodel Journal (archived here on TrainLife). I got a big spike in traffic recently, thanks to a lovely shout-out by well-known author and layout designer Lance Mindheim. If you’re here because you read the August 31st posting on Lance’s blog, then welcome! Lance and I both have interests and commitments beyond model railroading, and we think the same way about how a hobby should fit into the rest of our lives without becoming overwhelming. At the same time, we also see eye to eye on the value of model railroading as a medium through which we can challenge ourselves. This hobby is an excellent way to learn new things and push our abilities – and if we don’t do that, I feel we’re squandering a great opportunity. Lance approached me recently about using a couple of photos for a blog posting he was working on. Even so, his kind words came as a delightful surprise. Thanks, Lance – and keep up the great work!